What is gloss paint and where do I use it? 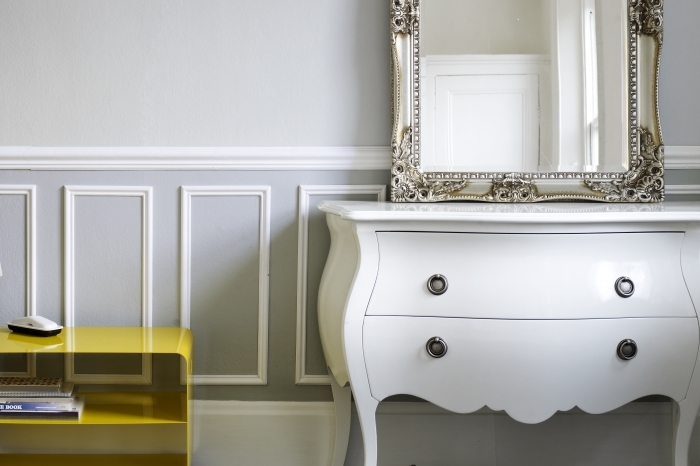 Gloss paint has been used traditionally as the ‘go to’ paint for woodwork, doors and trims. In the past gloss paint was oil based, was prone to yellowing and could even contain harmful lead. Thankfully this is no longer the case as modern gloss paints are waterbased, with minimal VOC content and provide the benefits of a hardwearing paint without the drawback of yellowing over time. What does ‘gloss’ mean and what are its properties? The word gloss refers to the sheen level of the paint. The higher the sheen level, the more reflective the paint will be. A gloss finish reflects the most light, so is the most ‘shiny’. Our 1829 gloss paint is a hardwearing, durable and washable finish so is ideal for use in areas of high wear such as interior doors and skirting boards. 1829 gloss can also be used outside, so feel free to protect your front door or garden furniture in one of our vintage colours. Gloss can also be used on suitably prepared metal, so you can match your radiators to your doors and trim. How do I apply gloss paint? Gloss paint can be applied using a brush, roller or spray, once the surface has been suitable prepared. Craig & Rose have a range of high quality detail paint brushes that can be used with gloss paint. When applying to previously painted surfaces you may need to rub down the surface and remove loose flaking paint or fill holes with filler. You may need to use an undercoat to seal bare or new surfaces, or prepare metal with a metal primer. Our 1829 gloss paints are available in all 110 colours in the 1829 vintage colour collection. Our most popular colour groups in gloss paints range from the ever enduring whites, to the ‘of the now’ greens, the ‘new neutral’ greys and the deep, inky blues which have been on trend for the last few years. For a traditional and fresh look, whites and light grey are ideal. For a dramatic take on colour, match your deep toned walls and trim for a colour block look. Or go for contrast with a deep dark trim and a light, airy wall. There are no wrong answers! For extra inspiration, view our suggested colour schemes underneath each colour on site.